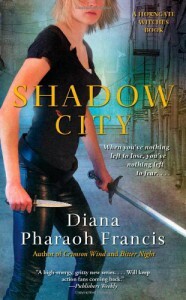 Shadow City is the third book of the Horngate Witches series and brings all that you expect from this urban fantasy series...plus some answers and insights! Scooter! Now this is a character that is well written and puzzling. From his first introduction you knew he was more than he appeared and let on, now you finally get to find out what it was about him that had you scratching the back of your mind. Scooter needs Max, really needs her. She is to be his champion in the otherworldly Shadow City. Lucky for us she is able to drag along all her ‘friends’ and Alexander. Everyone needs friends...and Max most of all. Now if this girl would only let down her emotional guard. The ending gives some hope. Lets see what Francis lets happen with book four.